Which side is the defender on? A hilarious mistake while defending allowed Gillingham to score an easy goal against Yeovil Town in a Capital One Cup match yesterday. 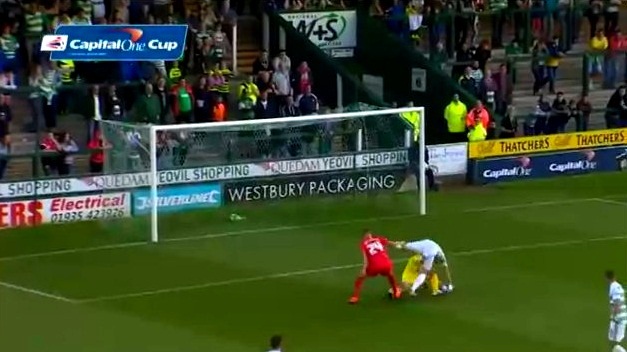 Yeovil Town defender Aaron Martin was trying to shiled the ball away from Gillingham striker Brennan Dickenson so that goalkeeper Artur Krysiak could collect the ball. But there is a saying about always keeping your eye on the ball. The defender looking over his shoulder failed to see how close the goalkeeper was leading to a comical error which allowed Dickenson to stroke the ball into an empty net while the defender lay on the ground after tripping over the goalkeeper in an attempt to block the shot. Carabao Cup 2018-19 Final: How Chelsea could line-up their starting XI against Manchester City?